GetFoldersize allows you to determine the size of folders and sub-folders on your hard drive. Determine which programs are taking up your hard disk space. For each folder, you can display the total file size and the number of files and subfolders in the folder. Note: program discontinued, linked to Archive.org. How to extract: Download the "Portable Edition" ZIP package and extract to a folder of your choice. Launch GetFoldersizePortable.exe. Chinese translation of the user interface. File List / Toolbar: Added the option "Automatically optimize the column width". 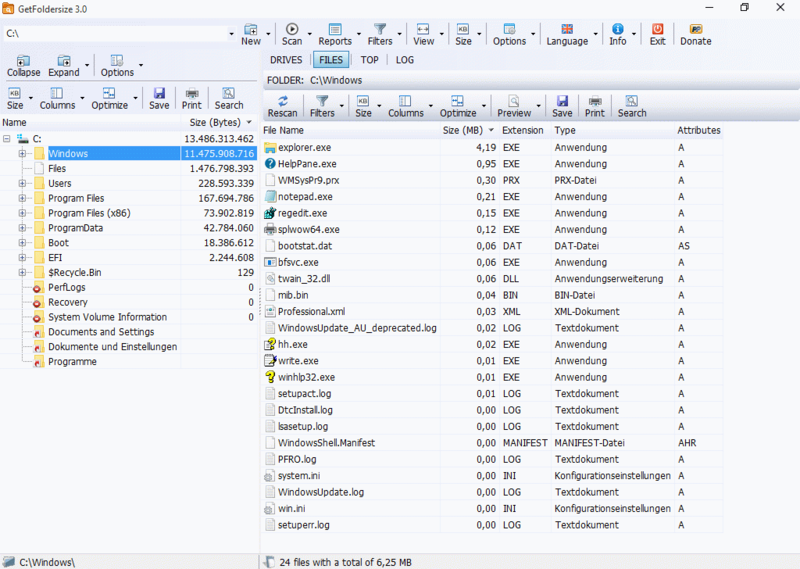 Various optimizations have been introduced in various sections of GetFoldersize. Various bugs have been fixed. Both the site and download links redirect to the TreeSize site. The developer of GetFoldersize was kind enough to promise to restore the smaller icons in the next release. GetFoldersize 3.0.2 has been released. In the new release there is no option to use the smaller icons in the tool-bar so I will keep to version 3.0- the large icons are too big for me. - NEW: Added Portuguese translation of the user interface. - UPD: Main Toolbar / Options: Removed the option "Big icons". - (!!! ): Removed support for Windows 2000. - FIX: Various optimizations have been introduced in various sections of GetFoldersize. Various bugs have been fixed. Now i have only XP SP3 x86..im still waiting for Win 8. Support Intel/AMD/ARM processors..also disigned for tablet/touch screen PC. Im running Win7/64 SP1 and have no problems. Great Addition, this will help me keep track of what trash is left behind from software. Don't know what happen, I can't run this program in my clean XPSP3 x86. Dependency check is past, but why it always freeze at first run...headache...headache.